Edith Wharton’s, The House of Mirth, is one of my favorite books. It quite simply blew me away. There were so many times her words stole my breath — like music — expressing the inexpressible. I’m unable to lend my copy to anyone as I’ve marked up the margins…considerably. Each time I come to the last page of one of Wharton’s books and face those impending words, THE END, sadness creeps in. I simply can’t get enough. 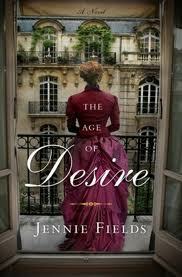 So, you can imagine how happy I was when I saw the recently published, The Age of Desire by Jennie Fields, on one of my various newsfeeds. The Age of Desire is about the life of Pulitzer Prize-winning American novelist Edith Wharton with (of course) some historically fictionalized dialog and writing liberties taken in order for the book to read like a story. And it reads so beautifully! Author Jennie Fields, a Wharton enthusiast herself, put great effort into weaving together a journey through Edith’s life enabling us to get a glimpse of Wharton’s family, friends (such as Henry James), and her many travels between New York, Lenox, Massachusetts, and Europe making the book a very readable and enjoyable story. Seeing Edith in all her humanity, her struggles, her broken relationships, and of course the process of her writing made Edith-the-person very real for me. There are plenty of tidbits that admirers of Wharton might appreciate in the book. Personally, seeing how Edith’s mother may have subtly played a part in the creation of the character, Undine Spragg, was in and of itself an epiphany. I’m going to download a sample of Age of Desire onto my Kindle. Thanks for this recommendation! I just finished it. It was a quick read and I thought it was very well written. FYI, I heard EW’s ghost stories are wonderful. I plan to read those at some point…maybe October. Ghost stories! They must be somewhere on my Kindle in the complete works. I’ll look for them.